20 January marks the second anniversary of Donald Trump's inauguration as the 45th President of the United States. Sputnik takes a look at what he has achieved and where he has hit judicial or political roadblocks. During his inauguration speech in Washington, D.C., Trump painted a damning picture of the US under his predecessor Barack Obama. "Washington flourished — but the people did not share in its wealth….For too many of our citizens, a different reality exists: Mothers and children trapped in poverty in our inner cities; rusted-out factories scattered like tombstones across the landscape of our nation; an education system, flush with cash, but which leaves our young and beautiful students deprived of knowledge; and the crime and gangs and drugs that have stolen too many lives and robbed our country of so much unrealised potential," said Trump. So what has he done since then to tackle the issues he outlined in that speech on Capitol Hill and how have his opponents tried to sabotage him? On 22 December 2017 Trump signed the Tax Cuts and Jobs Act, which cut individuals' income tax rates, doubled the standards deduction and removed personal exemptions. The top rate of tax dropped to 37 percent (but the 10 percent rate for the very poorest remained unchanged) and corporate tax fell from 35 percent to 21 percent. The corporate cuts are permanent but the individual changes will expire in 2025, unless extended. Critics said these tax cuts mainly benefited the wealthy and were a return to the "trickle down" economics of the Ronald Reagan era. The Joint Committee on Taxation said the tax cuts would increase the deficit by US $1 trillion over the next decade. During the 2016 election campaign, Trump made great play of the damage which had been done to US manufacturing by globalisation and free trade arrangements, like the North American Free Trade Agreement (NAFTA). Almost five million US manufacturing jobs have been lost since 2000, with many moving to Mexico, China or other countries where the lower wages on offer to workers enable firms to undercut competitors in the US. Ironically, the decision to move those factories was often taken by Wall Street hedge funds to pacify stockholders — most of whom were Americans — who wanted a better return on their investment. Trump has tried, with varying success, to get manufacturers to return to the US or to build new plants in America. Ford cancelled plans for a US$1.6 billion factory in San Luis Potosi, Mexico — saving 3,500 US jobs — and created 700 new jobs with the expansion of a plant in Michigan. After meeting President-Elect Trump, Japanese mogul Masayoshi Son, who runs US telecoms firm Sprint, pledged to create 50,000 new jobs in the US. But in the 2018 Sprint and the German-owned T-Mobile US announced plans for a merger, which the Communications Workers of America union claims would lead to the loss of 28,000 US jobs. The Washington Post reported CEO John Legere and other T-Mobile US executives — who need the president's approval for the merger — have been staying at the Trump International Hotel in Washington. President Trump has been at war with the media from the moment he was elected in November 2016 — in some cases long before that date. While he largely has the support of Fox News and a handful of maverick reporters and conservative commentators, for the most part the media — especially those based in Democrat strongholds like New York, Washington, California and Chicago — have dogged him for the last two years. Many US journalists seem to have refused to accept the result of the election and are determined to make out it was fabricated or came about as a result of a dastardly Russian conspiracy despite little or no evidence. Trump: Why don’t we build a wall and fix it. There was virtually no criticism of Hillary Clinton for her inept campaign, which lacked a single clear policy which differentiated her from her husband, or Obama or offered any tangible benefits for Americans. Instead the New York Times, the Washington Post, CNN and numerous other mainstream media organisations have sought to dig up dirt on Trump and have highlighted every little typo or grammatical mistake he has made on Twitter. The hostility from the media began from the get go, with widespread mockery of the size of the crowd at the inauguration. White House Press Secretary Sean Spicer rebuked the media. "These attempts to lessen the enthusiasm of the inauguration are shameful and wrong," Spicer said. The liberal media's attacks on Trump reached their peak during the Acosta affair. 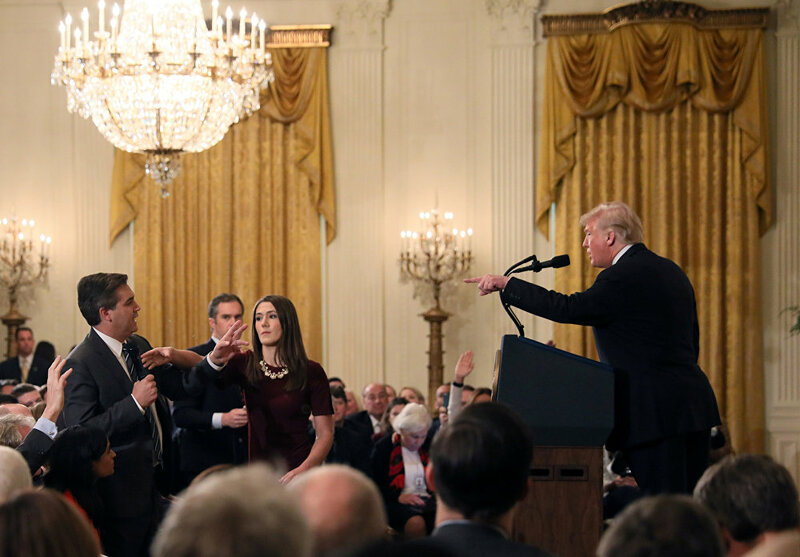 CNN journalist Jim Acosta lost his White House press pass when he broke protocol and refused to surrender his microphone during a heated press conference with US President Donald Trump in November 2018. "When you're in the White House, this is a very sacred place to me. This is a very special place. You have to treat the White House with respect, you have to treat the presidency with respect," said Trump. Reacting to the move, CNN filed a lawsuit against Trump's administration over the correspondent's press credentials. More than a dozen news outlets and journalist organisations sided with CNN and filed friend-of-the-court briefs in support of CNN's lawsuit, including Fox News, NBC, the Press Freedom Defense Fund and The New York Times. Eventually, the White House backed down and gave him his press pass back. In May 2018 the president's $867 billion US Farm Bill failed to make it through the House of Representatives, with 30 Republicans voting against it, largely because they feared it would allow in too many migrant farm workers. A compromise bill, which has left out stricter work requirements sought by Republicans for people getting food stamps, was finally approved and signed into law last month but has been delayed by the breakdown in relationships between Democrats and Republicans in Congress. The Farm Bill — officially called the Agriculture Improvement Act — covers a wide range of fields — from providing an additional $500 million to help find new foreign markets for US agricultural products to legalising the production of industrial hemp. "You need people to help you with the farms. 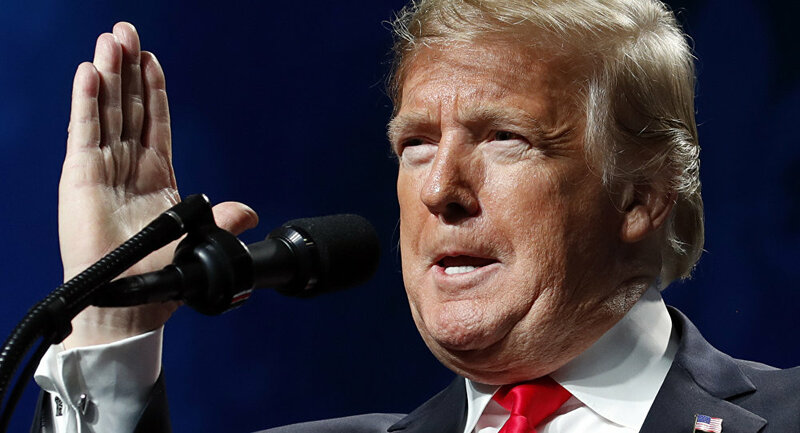 It's going to be easier for them to get in," Trump told a farming convention in New Orleans on Monday, 14 January 2019. Lemuel and Shelby Ricks — who grow cotton, soybeans, wheat and peanuts on their farm in North Carolina — said they had been hit by low commodity prices, partly caused by Trump's trade wars. "But we're not giving up on him now," said Shelby Ricks, who voted for Trump in 2016 and said he would do so again in 2020. While telling US farmers he will get them those pesky migrant workers they need to pick their crops at harvest time, Trump has also been emphasising the importance of keeping out migrants, especially along the Mexican border. When Trump was campaigning for election in 2016 he frequently said the new "border wall" he planned to build along the US southern frontier would be paid for by Mexico… in full. But Mexican President Enrique Pena Nieto made it abundantly clear that Mexico had no intention of paying for the wall, and he repeated this in May 2018 when he tweeted to President Trump: "NO. Mexico will NEVER pay for a wall. Not now, not ever." His left-wing successor Andres Manuel Lopez Obrador has maintained this stance and said earlier this month that he would not get involved in what he referred to as "an internal US political matter". 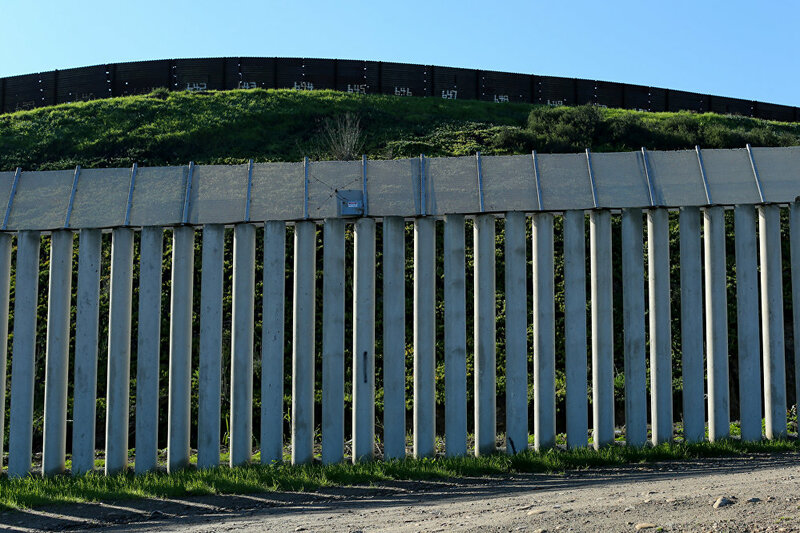 The border wall separating the United States and Mexico is pictured in San Ysidro, California. So Trump — while claiming the money would be clawed back from Mexico through a new trade agreement — has gone cap in hand to Congress to ask for the estimated $5.7 billion needed for its construction. The Democrats have flatly refused, claiming it is a waste of taxpayers' money. This has led to the longest shutdown of the federal government in US history. In the meantime, NBC News reported this month that a steel prototype for Trump's long-promised wall had failed tests carried out by the US Marine Corps, which discovered it could be cut through using saws. Obamacare intended to extend health insurance coverage to the estimated 15 per cent of Americans who lacked it and were not covered by other health programmes, such as Medicare and Medicaid. The law created state-run marketplaces where individuals can compare prices as they shop for coverage. Barack Obama signed the Affordable Care Act in 2010, and most of the provisions took effect in 2014. The act has faced fierce opposition from the Republican Party and President Trump pledged to repeal and replace what has been dubbed Obamacare since the early days of his administration. However, all attempts to achieve that goal have so far failed in Congress. Last year, Obama claimed that he had urged Trump make some adjustments to the programme, change the name and take credit for it. When Trump was campaigning for the White House in 2016 he promised to invest billions of dollars in tired US infrastructure. Much of the US' existing infrastructure was built between 1933 and 1970, a period which began with President Franklin D. Roosevelt's famous New Deal, which involved huge public investment in projects such as the Hoover Dam in order to tackle the high unemployment of the Great Depression. The US has 614,387 bridges, 40 per cent of which are at least 50 years old and 56,007 are "structurally deficient" but still in use. One of the first things Trump did when he arrived in the Oval Office was speed up environmental reviews in order to expedite his planned $1 trillion infrastructure programme. So far he has failed to get the programme passed by Congress. But after the mid-term elections in November, Peter DeFazio, the Democrat who was set to become head of the House of Representatives committee overseeing transportation, said he hoped they could approve infrastructure legislation in the first six months of 2019. That was before Trump and the Democrats reached a stalemate over the budget. On the campaign trail in 2016, President Trump sang the virtues of the US coal industry and was rewarded with millions of votes in mining strongholds like West Virginia, Kentucky, Pennsylvania and Wyoming. But he has found out the reality — that energy produced by coal is more expensive than that produced by fracking and few companies want to invest in it. The Trump administration is considering co-operating with private companies to transport coal and liquefied natural gas (LNG) through US Navy bases and other federal facilities. But his plans to export coal through military bases on the US West Coast undermines national security and ignores environmental laws. Trump has also tried to push through oil pipelines despite widespread opposition from environmentalists and Native Americans. In March 2017 the State Department issued a permit for TransCanada to construct the $8 billion Keystone XL pipeline after Trump approved it. Former President Barack Obama had previously blocked the project in 2015. The 1,179-mile pipeline would carry up to 830,000 barrels of crude oil per day from the Canadian province of Alberta to the US state of Nebraska and down to oil refineries on the Texas Gulf Coast. But in November 2018 a federal judge in Montana blocked the project again, arguing the Trump administration had failed to properly analyse such the environmental impact of greenhouse gases from the pipeline and the risks of oil spills. One pipeline that has begun operating is the controversial Dakota Access pipeline. Hundreds of protesters were demonstrating against it at the time of Trump's inauguration in January 2017. Native American tribes, including the Standing Rock Sioux, oppose the nearly 1,200-mile pipeline in South Dakota because they claimed it threatened sacred territory and vital water resources. The demonstrators' camp was finally closed down by the military and the pipeline began operating in June 2017. The mid-term elections in November 2018 were seen as a test of Trump's popularity although in most cases they were really a test of the popularity of those running for numerous seats in the Senate, House of Representatives and Governors' mansions across the country. Although the Democrats tried to claim it was a huge victory, but it was really more of a draw. The Democrats captured the House of Representatives — and soon installed the arch-obstructor Nancy Pelosi as Majority Leader — while the Republicans expanded their majority in the Senate and retook one Governor's mansion — in Alaska. But the expected blue wave of Democrat victories failed to emerge. Jacqueline Luqman, co-editor-in-chief of Luqman Nation, said she thought the election was a victory for the Republicans. "This was not the great referendum against Donald Trump that the Democrats said it was going to be and the blue wave simply didn't materialise, especially in state and local races that had little to do with the president and where having an R next to your name doesn't automatically equate you with Trump. That is a win for Trump," Luqman told Sputnik. Among those who were elected to the House of Representatives for the first time was Alexandria Ocasio-Cortez, 29, who rose from obscurity to unseat long-time Democratic Rep. Joseph Crowley in New York's 14th Congressional District primary earlier this year. Since her election, she has made a number of controversial statements which have provoked strong responses, including accusing the former White House Chief of Staff and retired Marine Corps General John F. Kelly of "cowardice." Ocasio-Cortez was effectively told to pipe down by actress and veteran Democrat supporter Whoopi Goldberg last week. "There are a whole bunch of people in the Democratic party who have been busting their asses to make sure that women get what they need, people get what they need, children get what they need. You just got in there and I know you've got lots of good ideas, but I would encourage you to sit still for a minute and learn the job," Goldberg told Ocasio-Cortez. The US spends 54 per cent of its budget on defence, in comparison to Britain, which only spends six per cent. Under President Obama $598 billion was earmarked for defence and under Trump that went up to $686 billion in 2018. This year's military budget bill was named the John S. McCain National Defense Authorisation Act, in honour of the late US senator, a former naval pilot and prisoner of war in Vietnam. Last month Trump agreed to increase the Pentagon's budget to $750 billion, which will include $10 billion for a new Space Force. Trump admitted US defence spending was "crazy" but blamed an "uncontrollable arms race" with China and Russia. But China spends $228 billion per year while Russia's annual spending is only $69 billion. Among the US military projects which has been beleaguered by problems has been the F-35 fighter jet. As a result of the mid-term elections the political complexion of Congress changed and it soon became clear the Democrat-controlled House of Representatives would not allow through President Trump's budget, which allotted $5.7bn to his promised border wall along the Mexican frontier. The Democrats, who draw much of their support from Hispanic communities in California, Texas and elsewhere — claim it is a waste of taxpayers' money. But a poll by the Pew Research Center discovered 82 percent of Republicans and Republican-leaning independents favour building the wall, a record high since PEW began asking the question in 2016, and Trump has no intention of backing down over his signature policy, which is designed to reduce the number of illegal immigrants in the US. 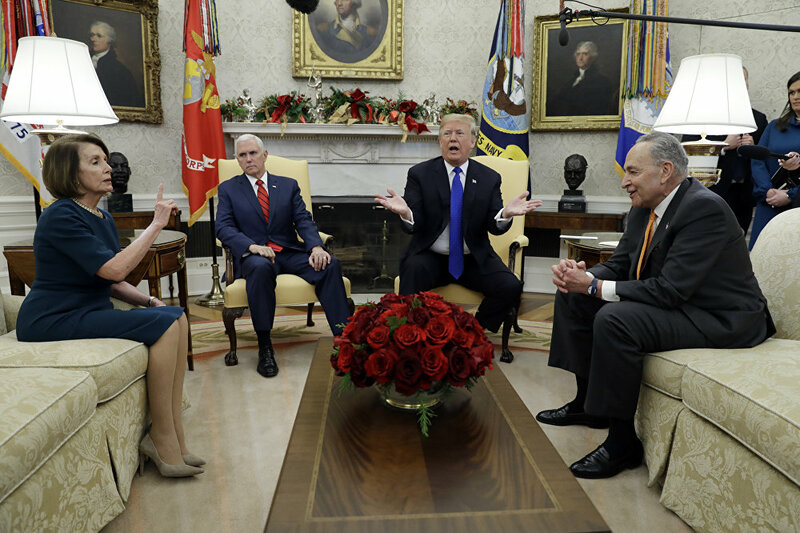 President Donald Trump and Vice President Mike Pence meet with Senate Minority Leader Chuck Schumer, D-N.Y., and House Minority Leader Nancy Pelosi, D-Calif., in the Oval Office of the White House, Tuesday, Dec. 11, 2018, in Washington. The impasse led to a partial shutdown of the federal government, which has meant 800,000 federal workers have missed their paychecks since 22 December.he State Department, the Justice Department, the Transportation Department, the Agriculture Department, and the Department of the Interior are among those affected by the shutdown. Also affected are the White House catering staff. On Thursday, January 17, Trump sent a letter to Pelosi informing her that her trip to Brussels, Egypt and Afghanistan was cancelled as a result of the current US government shutdown. He has refused to sanction her using a military plane to make the trip because he wants her to be in Washington to continue negotiations on reaching a deal on the budget, which would end the shutdown.